Give your cars the glistening showroom shine with UNIMAC Car Buffer & Polisher, exclusively offered online on Edisons. Whether you’re a beginner, casual auto enthusiast, or a professional detailer, the UNIMAC Buffer & Polisher will give your car an impeccable sheen every single time. Powered by a robust 1400W motor with 6 variable speeds, the UNIMAC Buffer & Polisher rotates at dizzying speeds of up to 3200 RPM. The ergonomic rubber D-handle and lightweight construction allows for easy manoeuvrability. The polisher comes with two pads -- wool for buffing and foam for polishing -- and is encased in a heavy-duty carry case for the highest protection. 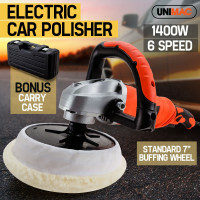 Whether you’re smoothing your car of unwanted scratches or looking for a professional-looking polish, the UNIMAC Buffer & Polisher has got your back. Round up all your auto needs and buy a Driving Lights, 4WD Snorkel Kits, 4WD Storage Drawers, Car Awnings, Ute Toolboxes and a Roof Racks & Carriers today, available online on Edisons. All UNIMAC Buffers & Polishers are backed by an extensive 12-month domestic warranty and a standard 3-month warranty for commercial usage. 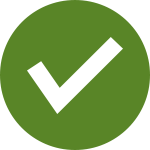 Guaranteed fast and easy delivery anywhere, whether you’re in Sydney or in the Outback, only from Edisons. Buy a UNIMAC Car Buffer & Polisher today and all your cars will look like it just rolled off the lot.